Looking about our planet and its varied freshwater environments, it's not surprising to find that there are many and varying type habitats... Some colder, others warmer... where the water has more/less dissolved solids, oxygen, is softer/harder, of high/low to middling pH, there are places where light is bright, the water clear and not... waters calm and briskly moving... . There are many other factors that one might list to differentiate the many diverse habitats of freshwaters... but these stated identify the principal characteristics in helping us decide which fishes, invertebrates and plants we might keep together. Ideally, you will be able and willing to study up ahead concerning the aquarium hobby to where you knowledgeably choose BOTH the system AND the livestock you intend to keep, instead of "ending up" with a tank of certain size/shape, filtration/aeration/circulation gear, lighting et al... that impinge on your ability to choose and suit the life you intend to keep. In this ideal circumstance, you would know the quality of the part of the water world you intend to mimic... and the livestock's' needs specifically. 1) The size/shape of the tank needed... how much it weighs, where you'd place it. 4) What sorts of lighting; brightness, quality... timers to aid in creating a steady light/dark cycle. 1) Best initial purchase size range, growth rate, likely maximum size. 4) Temperament; likelihood of bullying, predation. 5) Habits of swimming/location, space needs. Most folks will be finding themselves already in a "fixed" position of having a set-up in hand, or at least the principal components. Given this perspective, or starting point, you can work out what you might want to keep in a few ways... My favorite approach involves building a collection around a "must have" organism... Something that I really want to keep... and working from there in making sure the conditions that my "number one" piece of livestock enjoys are amenable to my secondary et al. choices. As an example, let's say I have a 29 gallon aquarium... nominally 30 wide, 12 deep front to back and 18 inches tall. For my must have centerpiece I want to keep an African Butterflyfish, Pantodon buchholzi. Doing a bit of looking up I have an idea of its likely purchase size... about 3-4 inches, it's maximum size, without the tail, is about four inches... And what sorts of water conditions this fish likes: Softer, acidic, tropical... and not too much light as it lives near the surface, nor current... Oh, and a completely covered top... so it doesn't leap out of the tank! African or Freshwater Butterflyfish, Pantodon buchholzi, Peters 1877. A great favorite, and fabulous jumper... To four inches in length. Feeds on live crustaceans, insects and fishes. Note that you really don't need to be overly concerned with "how" hard or soft your water is, nor usually with whether it's tropical or cold water... Just the general matter of whether this is so for the species you intend to keep. Similarly, some freshwater fishes will tolerate some salt content in their water, but by and large, it is best to keep freshwater systems fresh, brackish as so, and marines in turn as full-strength saltwater. Phenacogrammus interruptus (Boulenger 1899), the Congo Tetra. Central Africa; the Congo. Males to a little over three inches, females to two and a half. Cond.s pH 6-8, dH 5-19, temp. 23-26 C. Feed on meaty foods, plant material. Aquarium photo. As previously stated, the African Butterflyfish doesn't like too-bright lighting, and you want to keep it feeling safe and secure to discount it jumping and injuring itself... Live plants do all sorts of good things for freshwater systems. 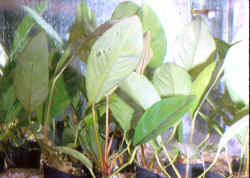 Some good "biotopic" selections include slow-growers of the genus Anubias, fast-growing Crinums, and Bolbitis heudelotii. 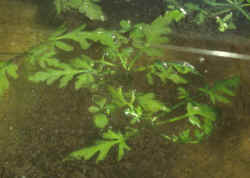 Another excellent choice and personal all-time favorite aquarium plant choice is the "Indian Fern" (it is found in Africa), Ceratopteris thalictroides, or the congener C. cornuta. Pantodons love the shade this genus supplies (grown floating... it can be rooted as well), and they do very well in low-current settings. Anubias barteri "nana" at right; Anubias afzelii, Anubias congensis below. I can't state emphatically enough just how important list-making as a tool can be... There is no better way for you to gather and absorb useful information than applying your mind, hand, pen and paper... A table of the qualities you're looking for, species to mix can be easily constructed and the "boxes" filled in with simple (and fun!) searching. Believe me, finding out all this before spending good money on life that may not be compatible... is the way to go. Finding Out About All This? Resources abound for a curious mind... the Net has a myriad of sites, BB's... and there are a plethora of in-print books and magazines... that are easy to search with a little help from a librarian. Again, I urge you to take good (written) notes re what you want and its specific needs... and to record the sources of this information. Unfortunately, a good deal of what is posted on the Net is a bit "noisy"... not often in total agreement. It is best to take all you encounter with "a grain of salt", and remain speculative re single source, personal accounts. A hodge-podge approach to stocking ones aquarium system is to be guarded against... These "garden variety" mixes of supposed "community" organisms rarely work out satisfactorily... With unneeded tension, extra maintenance and poor showing, growth and behavior of specimens as consequence of slipshod, inadequate investigation ahead of their acquisition. Do be a conscientious consumer and look into the needs and compatibility of the life you intend to keep BEFORE buying it. To the extent that you know what you're doing, so much more will be your enjoyment and understanding of your aquarium world.